Integration of Bullet Physics into Magnum. 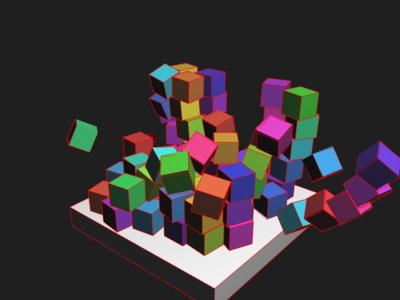 A rotating table full of cubes that you can shoot down, showcasing the BulletIntegration library together with SceneGraph using BulletIntegration::MotionState. It's also possible to visualize various properties of the Bullet physics world using BulletIntegration::DebugDraw. This example was originally contributed by Jan Dupal and further improved by Max Schwarz. The example makes use of the Bullet Physics library, see documentation of the BulletIntegration namespace for license information.